Djurgardens and Hammarby fans briefly clashed in the stands at the end of their match on Sunday night. 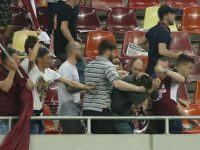 Sparta Prague fans caused trouble at the Mestsky Stadium in the northeastern Czech city of Ostrava during Saturday's clash with Banik. "Football Beasts", a new RT documentary on football hooligans in Europe that was released on Wednesday. A group of Roma hooligans attacked Liverpool supporters outside Anfield before Tuesday’s Champions League semi-final between the two sides. 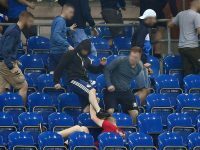 Schalke and Eintracht Frankfurt hooligans clashed in the stands following the full-time whistle of their DFB Pokal match on Wednesday. Crvena Zvezda fans attempted to attack rival Partizan supporters at the Rajko Mitic stadium during Saturday's Belgrade derby. 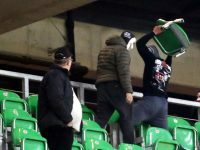 CSA Steaua and Academia Rapid fans clashed in the stands at Bucharest’s Arena National during their Liga IV match on Saturday. Borussia M'gladbach hooligans managed to pinch a Köln flag during Köln's away match against Hoffenheim on Saturday. 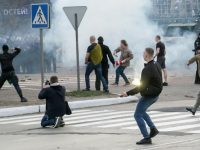 Dynamo Kyiv hooligans were involved in a confrontation with cops outside the ground during their side's clash with Mariupol on Sunday. GKS Tychy’s home match against Ruch Chorzów was briefly halted on Saturday because of trouble in the stands.